Gucci T-shirt featuring the faces of Orso and Bosco, the Boston terriers of Gucci's Creative Director Alessandro Michele. Approx. 28"L down center back. "Maison de l'amour" (house of love) text. Crew neckline. Short sleeves. Cotton. Made in Italy. 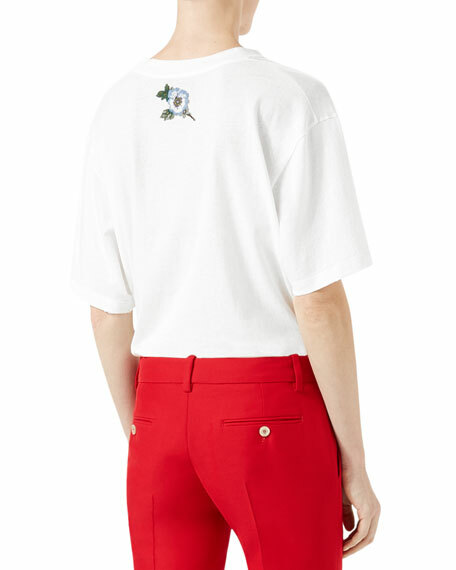 Gucci T-shirt in m? ?lange cotton jersey and vintage logo. Glittery tiger print on front. Crew neckline. Short sleeves. Oversize fit. 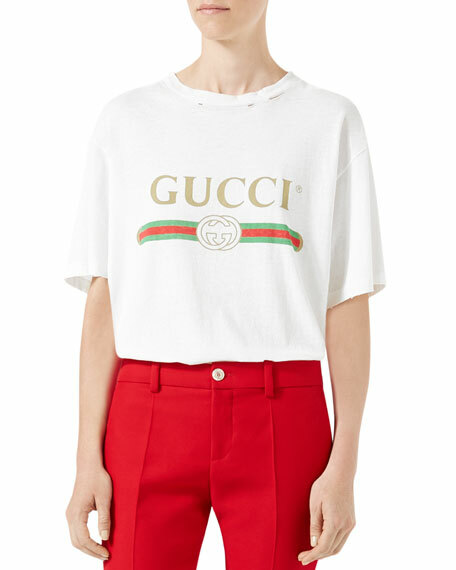 Gucci T-shirt in m? ?lange cotton jersey and vintage logo. Glittery tiger print on front. Crew neckline. Short sleeves. Oversize fit. Cotton. Made in Italy.